But through the years, I have learned to appreciate failure. Why? Because I’ve failed a lot! I’ve failed big time. And these failures became the sources of my biggest winnings. Let me share with you two of my biggest failures. 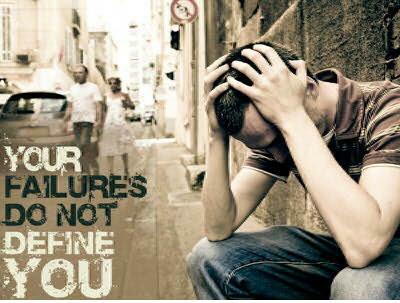 You may have failures but you are not a failure. Failure # 1: MBA Scholarship – Denied! A few years ago, I wanted so much to pursue MBA in one of the best MBA schools in Asia under a scholarship grant. I got accepted in International University of Japan (IUJ). I applied for an ADB scholarship because I couldn’t afford the tuition fee which cost millions. I clearly remember that day when I excitedly opened the email from IUJ. Everything went blank. My tears were about to fall. I went to the Adoration Chapel near our apartment as fast as I could. Good thing, no one was there except Him and me. I poured my disappointment and frustrations to God. I was crying inconsolably. I said, “Lord naman… I prayed for it. I did my best. Why? Lord, comfort me please…Help me understand…” I was crying like a child who was denied of her favorite toy. I confronted God and I cried and cried until my tears went dry. I began to feel better. Then I went out of the Adoration Chapel and called up my parents who took turns in comforting me. I was feeling better and better. Then I went to the convenience store right in front of the Church and I bought chocolate ice cream. Mmmm.. Yummy! I was enjoying the ice cream until I forgot about the scholarship. I spent the rest of the day like any normal day. I guess I was able to fully recover. Failure # 2: What a mess, financially! When I started working in the corporate world, I got so overwhelmed with my salary and with credit cards. I felt that I will never run out of money because it gets replenished every 15th and 30th of the month. Plus, the credit card increased my purchasing power. I was ignorant to how money works. I was overspending. Until I realized that my net worth was negative because I maxed out the credit limit of my two cards in just one year! And no matter how hard I worked, it seemed that money was never be enough and my debts continued to pile up. In short, I had financial bloopers. During the process of applying for an MBA abroad, I had to take GMAT (Graduate Management Admission Test). The GMAT had two essays called Analysis of an Issue and Analysis of an Argument. I got perfect scores in the essay portion of the exam! Whoa! I never really thought I was good at writing. I might not have gotten an MBA scholarship but I got something much better – I discovered that I have a talent in writing. How can I make my situation better? When I failed big time in my finances because I maxed out the credit limits of my two cards in just one year, it created a pain in me that inspired me to really do something to improve my finances. I educated myself through books, seminars, dialogue with successful people, etc. Finally, I was able to zero out my credit card debts in three years. How can I use my failures to bless others? I realized that a lot of yuppies and employees in general, were also in the same boat I was in. Many yuppies were also experiencing problems with credit cards, money, savings, etc. This inspired me to share what I learned in personal financial management. And so I used my gift in writing to share the message. The result was the first book I authored called Think Rich Yuppies. I thank God I failed. Otherwise, I wouldn’t have had that zeal to write books. I have other big failures. Have you failed recently? That’s great! Failure is a necessary part of success. Surveys say that many of the businesses failed countless times before finally succeeding. They succeeded because of the numerous lessons that came with failing. Just don’t make the mistake of making failure an excuse to do a mediocre job, okay? Walt Disney was turned down 302 times before one investor finally said YES to finance his Disneyland idea. Imagine if he was afraid to fail and he quit on the 2nd attempt or on the 100th attempt or on the 302nd attempt. There would be no Disneyland today. Col. Sanders was turned down 1009 times before one restaurant owner agreed to him royalty for his chicken recipe and the rest of the KFC (Kentucky Fried Chicken) story is history. The famous post-it was a result of a failed adhesive. If you’re not afraid to fail, remember all the possibilities that you could do. If you’re a guy, perhaps you will finally be able to admit to that girl that you like her. Perhaps, you finally invested in the stock market. If you’re in sales, perhaps, you finally called up that prospect and presented your product to him/her. Perhaps, you finally took that licensure exam. Perhaps, you have financial problems. Perhaps, you failed in an exam. Perhaps, your girl friend or boy friend dumped you. Perhaps, you’re stuck in a job that bores you. Perhaps, you partnered with someone who turned out to be a thief. When you encounter failures, cry if you must. Vent out your emotions if you want. Get angry. Forgive yourself. Forgive the other person. Eat ice cream. Eat chocolates (Don’t do this if you have diabetes or toothache, okay?). Then do some creative and productive thinking. These questions will liberate you. You’ll discover something great! Who knows, that failure may be a gift placed in an ugly box. That failure could be the source of your winning! Remember, you may have failures but you are not a failure. Beneath the failures could be the hidden treasures. Did you like this article? Share us your story by leaving a comment below. Text by Sha Nacino Copyright © 2011 All rights reserved. Simultaneously posted in Learn. Laugh. Love. @ www.happysha.com. P.S. My friend Jojy Azurin posted this question, “Who else wants to earn up to 5 dollar figures a month from an online business – without leaving the Philippines?” Check out his website HERE. I started failing late in my life. I was too comfortable with my life before, I was just “there”, floating with no direction. I have no big income to speak of but I have no dependents, no household bills to pay, and I pay all of my credit card bills on time and in full. But I was in my 40’s when I realized this is not the life I wanted. So, since 2 years ago, I started failing. I failed in the stock market. I failed in the foreign exchange. I came across real estate deals that didn’t push through. That was because I was too eager without having enough information at hand before diving in. Now, I am ready to win, big time. Indeed,in those times of failures, we learn more of ourselves and discover our core gifts that would catapult us to success. As Bo Sanchez says, FAIL YOUR WAY TO SUCCESS. Meron ka ba ebook version ng Think Rich Yuppies? wla kc ako sa Manila ngaun eh. 🙂 Thanks2x! =) God bless u always! every time I fail, blessings comes to me, so now I am not afraid to fail, because i know something better will come. I agree with this article, failure is not the end of life but a beggining. Thank you for this! more please! Thank you ate Sha for sharing this wonderful message. I failed many times in my life such as; I put my money in the Forex Exchange without having information about it…so my money vanished. But I realized that my failure leads me to an open opportunity to learn more about where to invest money and to Financial Literacy. It taught me not to be afraid to fail because many successful people fail many times before they reach SUCCESS. So, I’m NOT alone. To fail is to succeed.